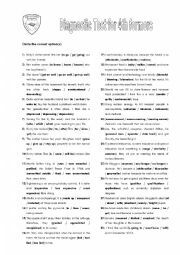 This is a worksheet for teachers of 4th formers, secondary education Tunisian curriculum. 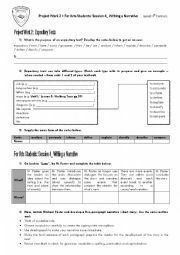 The opinions of the cyber students are taken from different sources including one worksheet I downloaded some time ago from ESLprintables. This worksheet is intended for teachers of 4th formers, secondary education, Tunisian curriculum. It is to be handed out in the last stage of the lesson (the production stage). 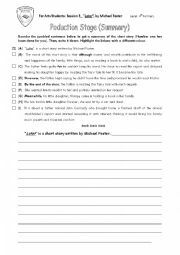 The learners should complete this gapped summary of the biography with reference to the text they´ve read. A worksheet for teachers of 4th formers, secondary education Tunisian curriculum. 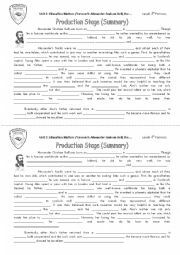 The extracts are taken from different sources including some worksheets I downloaded some time ago from ESLprintables. This is a 455-word text I took from: http://www.dailymail.co.uk/news/article-1308907/Miracle-meeting-nurse-walks-dying-patients-room--discovers-long-lost-father.html. 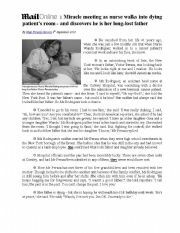 It is followed by 7 reading comprehension questions along with the key answers. Enjoy! This worksheet is intended for teachers of 4th formers (ARTS), secondary education, Tunisian curriculum. It is to be handed out in the last stage of the lesson (the production stage). The learners should reorder the jumbled sentences to get a summary of the short story. Then, write it down and highlight the linkers with a different colour. Mid-term Test Nr 2 for 4th formers (sciences) with the listening script. 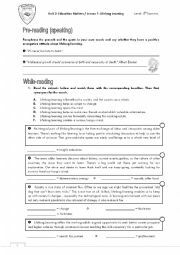 The language tasks are taken from multiple sources,including some ESLprintables members´ worksheets, though I´ve applied slight changes to them. This worksheet is intended for teachers of 4th formers (ARTS), secondary education, Tunisian curriculum. Mid-term Test Nr 2 for 3rd formers with listening script. The first language task is taken from one of sodfa´s tests (with some change) while the second is taken from another member´s worksheet as a complete paragraph, but I did edit it. A diagnostic test for 4th formers, secondary education Tunisian curriculum.